Spiti Valley in 2 Weeks – How to Plan your Trip and Explore? When I get asked about the minimum time required to visit Spiti valley, my answer is always 9 days. When someone asks me what number should be sufficient to see it all, I always tell them to plan for 11 or 12 days. But what if you have lesser than 9 or more than 12 days in hand? In that case, you will either be rushing through the journey or spending too much time in the valley. Rushing through sounds a little hectic but having more time is no hassle at all. 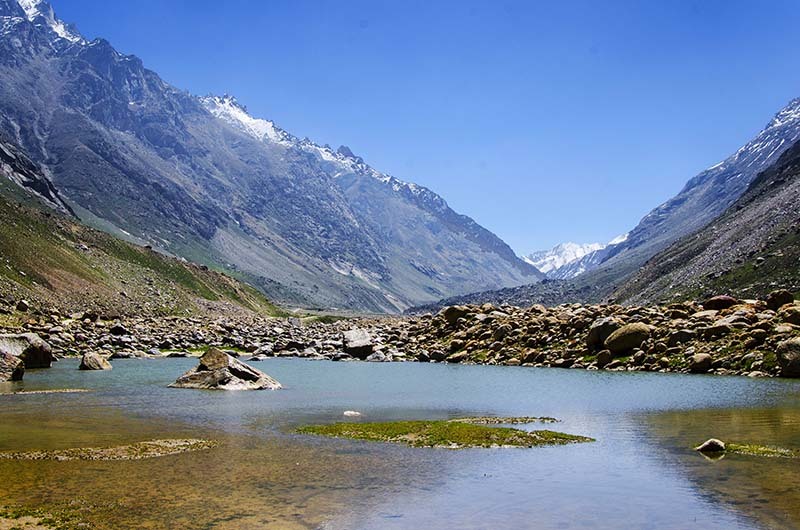 Spiti valley is a magic; an enchantment that will leave you wishing for more. Whether you were traveling to Spiti valley in 2 weeks or even more; you will still either want to stay a little bit longer or come back again. If you too were planning to visit Spiti in near future; and have a good 2 weeks time to explore it completely; then in this article I will provide details on how you can do so. I will suggest a few set of itineraries that you can follow, completing the journey in different ways. If after reading the article you have any other questions or need my help with your own itinerary, then you may comment and ask towards the bottom of this page. How to reach Spiti valley and when to go is usually the first question that comes to mind; so let me first cover this part. Contrary to common belief, Spiti valley remains open for tourism throughout the year. Yes, that is correct. You can plan a trip here anytime, even in peak winters. So when to go will actually depend on what exactly are you looking for. If you wanted to see a white snow-covered Spiti then Jan or Feb will be best. Month of August and September will be best if you want to see the lush green hills of Kinnaur and around Shimla and Manali. If you want to see a bit of snow but not too much then April or May will be good enough. For someone wanting to travel on the entire circuit then any month from June till early October will do. If you want to have the fun of trailing down on extremely bad roads with numerous water crossings and rain beating down on you then July or August is the time to go. So in the end, it will really be your own personal choice or convenience that will count. Now let us talk about how to go. Spiti can be accessed two ways. You can either reach here via Shimla or Manali. The road from Shimla remains open all 12 months except for occasional temporary roadblocks caused by extreme weather. However, even if that happens, authorities start restoration work immediately and clear the road just as soon as they are able to. Depending on your itinerary and places you want to cover; total distance traveled from Shimla to Kaza will be well over 500 kilometers; and will take you at least 2 days to cover. On the other hand, the road from Manali is the shorter of the two. It is a distance of about 200 kilometers that you can easily cover in about 8-9 hours; hence reaching Kaza from Manali on the same day. This short distance however will also take you through some extremely bad roads and across two high altitude passes; Rohtang La and Kunzum La. Both these passes are notorious for receiving high amounts of snow each year due to which this road is open only from June till September. For rest of the time, it remains blocked and snowed out. So keeping the above in mind, I will suggest three different type of itineraries. The first one will be covering the entire circuit but can only be done from June till early October. Second itinerary will start at Shimla and then end at Shimla only. This travel plan can be followed the entire year, irrespective of the month of your travel. Third itinerary will be for someone who just want to cover the Manali Kaza route and spend time only in Spiti valley; skipping the Kinnaur side of the journey. For the sake of this itinerary, I will assume that you are starting from Delhi. If you were coming from a different city, then only the travel for first and last day will be different. Rest of the plan will remain the same. I will provide a brief description of the itinerary below. For a list of places that you should visit at all these places, I will recommend that you read Tourist Attractions in Spiti Valley and along the Circuit. Below is a day by day breakdown of the journey. There is not much to write about this day really. It will be a long and monotonous journey of about 9 to 10 hours; depending upon your speed and breaks. Total distance traveled will be slightly over 400 kilometers; and the only good part is that the road conditions will be smooth. There is some road widening work going on between Shimla and Chandigarh so you may face some slow traffic in between. Then of course, you will be stuck in the crowded city of Shimla and its traffic. I personally prefer staying at Narkanda because I find Shimla a bit too commercialized these days. It does not really give the feeling of a tourist destination anymore. You can chose to either stay at Shimla or Narkanda but I will recommend the latter. If you reached well in time then you can also visit Hatu Peak at Narkanda before sundown. There are good amount of hotels at Narkanda and you will easily find a place to stay. Journey from today onward will not be too long until the last day when you go back home so you may take your own time leaving the bed every morning. Destination for today is Sarahan which is about 100 kilometers from Narkanda and will take 3 to 4 hours to complete. Before leaving Narkanda however, you may want to visit the nearby Hatu Peak. A visit to Hatu and back to Narkanda will take you a couple of hours at most. Also read: Why you should travel to Spiti via Shimla? From Narkanda, drive down to the banks of Sutlej River and continue to Jeori via Rampur. At Jeori main chowk, you will notice a narrow road climbing up to your right. This is the one you need to take to reach Sarahan. Ask around if you do not find this road there. From Jeori, you will drive up 16 kilometers to reach Sarahan and stay there for the night. Before hitting the bed though, do not forget to visit the famous Bhimakali temple. There is also a bird sanctuary at Sarahan that you may visit if it was open at your time of arrival. Road conditions for most part of this day will be good. On this day, you will travel only about 65 kilometers and the destination will be Kalpa. Road conditions will be mostly OK and travel time will be no more than 3 at most. Travel all the way back to Karcham, cross the bridge again and continue towards Reckong Peo. Now like Chitkul, Reckong Peo and Kalpa as well are not on the main highway. A few kilometers after Powari, there will be a petrol pump where you should tank up as the next petrol pump will be in Kaza. A little after this petrol pump, there will be a road going uphill to your left. Take this road and you will first reach Reckong Peo and then another 10 kilometers to Kalpa. This is a steep climb and very steep at some places in Kalpa; but the majestic view of Kinner Kailash that you will get from Kalpa makes it all worth it. There are a lot of hotels in Kalpa and you will easily find a place to stay. In order to get to the hotels though, cross the main Kalpa chowk and keep climbing up. There will be a couple of very narrow roads in between but keep moving up and you will start seeing all the hotels. In order to reach Mudh Village, you will have to reach Attargo bridge which is about 16 kilometers from Kaza. It is a huge bridge and there is a board marking it as an entrance to Pin Valley; so you will have no trouble spotting it. Cross the bridge and drive through the beautiful Pin Valley for 35 kilometers to Mudh Village. At Mudh, you can either stay at Tara Guest House or Ibex Guest House. If both of these were full then there are several other hotels there where you may stay. Towns of Keylong and Jispa are not really a part of Spiti valley. This part of Himachal actually falls under Lahaul district. But since you are not short on time and have another day to spare, spend this time exploring a little bit of Lahaul valley as well. From Chandratal, drive back 14 kilometers towards Kunzum Pass; back to the point where you took the turn yesterday. Continue then towards Batal. After Batal, it is one nightmare of the road for the next 60 kilometers, all the way till Gramphoo. You will be traveling through a completely broken road; full of boulders and numerous water crossings. The fun will end when you will exit on Manali Leh highway near Gramphoo; just after Rohtang top. From Gramphoo, continue on Manali Leh highway towards Keylong. Now in terms of accommodation, Keylong has far better number of hotels; but when it comes to scenic beauty, Jispa is far more beautiful. There are a couple of hotels and camp sites at Jispa where I will recommend that you stay. If you would rather prefer a cemented hotel than you can stay at Keylong. Today you will reach Manali after crossing Rohtang Pass. But before you do that, I will recommend that you do a bit of more exploring and add another pass to your trip. This will be the notorious Baralacha La. While going to the pass, you will also be seeing two more lakes on the way, Deepak and Suraj Taal. In order to reach Baralacha La, from Jispa you will have to drive towards Sarchu and then further to Leh. Drive al the way to the top of Baralacha La. Suraj Taal is located at the top of the pass. Spend some time there and then start your return journey. You will again reach Jispa, then Keylong and then back to Gramphoo. After Gramphoo, climb up to Rohtang Pass and then reach Manali by evening. Once again, nothing much to say about this day of the trip. It will be a long and tiring journey of 14 – 15 hours of driving back to Delhi; unless you are really lucky and live in a closer city like Chandigarh. And that will bring to an end to your amazing 14 days long trip to Spiti valley. The journey can of course be done in several other ways. You have plenty of time in hand and you can explore any way you want. You can add or remove destinations per your own preference; but I will suggest a few other alternate ways of the journey. Now all the above itineraries will have you starting from Shimla and ending the trip at Manali. But what if the Manali Kaza road was not open? In that case, you will start the trip from Shimla and then circle back to Shimla only. You can then plan your itinerary like this. On a few days, I have recommended staying at the villages of Hikkim, Langza, Kibber and Komik. These are remote villages that you will have to reach from Kaza. The benefit however is that these villages are way more scenic than Kaza town and will actually give you a true taste of Spiti life. There are no hotels at these villages really and you will be staying as a paying guest. For this, you will have to walk around in the village and talk to a few people about letting you stay as a paying guest. In a 14 days long trip, I will highly recommend that you spend some time living at these villages with the locals; and explore the area around. Do not get lost somewhere though while wandering around. IF you would like to plan this trip from Manali side only; and are not interested in exploring Kinnaur valley then the itinerary can be changed to something like below. I hope the information above on visiting Spiti Valley in 2 weeks was of help. As I mentioned, these were just a few sample itineraries but should at least give you an idea on how you can plan your journey. If neither of these itineraries look right to you; then feel free to ask in the comments section below; or at our Community Forum; and I will be happy to suggest something different. I will be travelling Spiti in September, Mostly using public transport and shared car. Yes it is definitely doable if that is what you are asking.